Have you discovered, as I have, that most young people have never heard of Dunkirk? Writer/director/producer Christopher Nolan has recreated it in an inspired movie that runs just one hour, forty-six minutes, exactly the right length for a required high school history class. 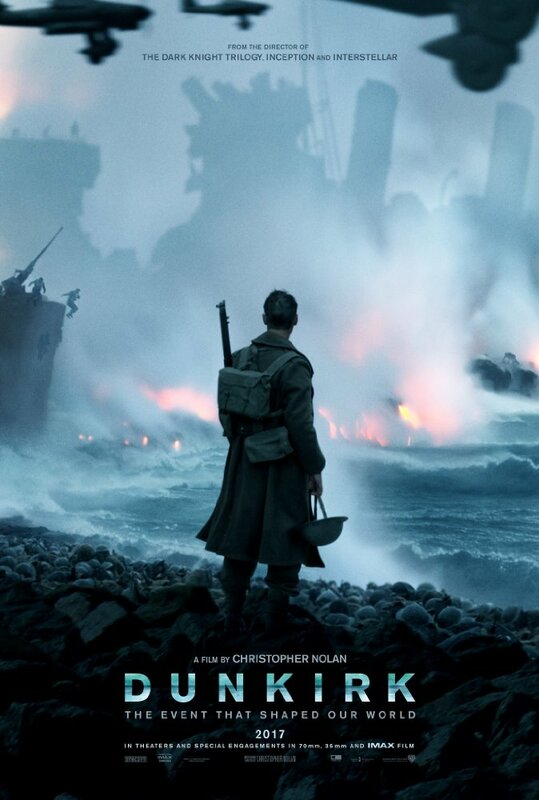 Nolan’s film is a tribute to the men who died and to those who rallied to rescue the allied forces trapped on the beaches of Dunkirk in 1940. It couldn’t be a better lesson that war can no longer be a solution for settling disagreements. Christopher Nolan filmed Dunkirk in three alternating sections on the beach, on the water, and in the air, all of it set against a relentless score of pure tension by Hans Zimmer. They have turned the volume high on the explosions, plane crashes, and bombs blowing ships and men to bits. Far louder than a normal soundtrack, it stuns the audience with the sounds of war. This is not the background noise of an ordinary war movie. It is the relentless noise of brutal death, and Nolan leaves us caught in tension through the whole battle. That’s the way it was. This is history brought to gruesome life at a time when the outcome of the war was thoroughly in doubt after the fall of France. Western Europe was broken. The allied forces went into full retreat ending in unimaginable death and injury as they came to the beach and the water where there was no safety. The few naval ships became targets for Nazi planes that were being shot down by British Spitfires. Soldiers on foot were trapped and dying in the open, no place to hide. The reason it is hard to salute specific actors is that there is very little dialogue here. Every young man is enveloped in noise and fear and all of them are surrounded by dying, broken soldiers. Suddenly the theater, rocked by an hour of noise, sees the screen fill with the small boats that came from everywhere to save 330,000 men. The audible gratitude throughout the audience is a tribute to the reality of the battle created by Christopher Nolan. A special salute is due Mark Rylance who, as a rescuer with a small boat, creates a character driven to stay in the danger by a deep set of personal values, a stand in, as it were, for all the civilians who rallied in their small boats. There are no false notes among others in the cast, just silent men knowing many of them will die. The beach behind them will soon be full of Nazi soldiers. The water ahead, the sky above, all full of German soldiers, sailors, and pilots determined to slaughter them as they wade into the open sea. War movies have never conveyed the reality of the sound of war and death. That is what Christopher Nolan has done to audiences with this movie. No one who sees it will forget the terrible sounds of inevitability. This review was posted on July 23, 2017, in Action/Adventure, Drama, History/Biography. Bookmark the permalink.